In the 1840s, daguerreotype photography launched photography as a new discipline and made it more accessible. It also made the idea of portraits popular among the middle classes. Very soon after the introduction of photography to the wider public, it quickly became a medium in which people saw death and life as two things that could be displayed using photography. Previously, only wealthy classes were able to afford and commission portraits of themselves. While technology began to rapidly change in the mid-19th century, opening up new possibilities for consumerism, other trends that were common before this continued. Perhaps among the most telling was the trend of high infant mortality and high mortality among urban populations that were exposed to new forms of infectious diseases, including high incidences of cholera. The introduction of photography and high death rates and increasing population meant a new market began to emerge in many industrial countries as families experienced the sharp loss of losing a loved one while looking for ways to memorialize them. This began the tradition of death or post-mortem portraits. There were earlier, Medieval and early modern traditions in Europe, in sculpture and paintings, that showed the body or deceased in different form of decay after they had died. Death masks were common from the Medieval period and throughout the modern period, including in the 19th century. These were often done to remind people of the presence of death and the need for Christ and God to save someone from eternal decay. However, showing someone almost immediately after they died in a portrait or even posing manner was a new, mid-19th century tradition that emerged in Great Britain, the United States, and in Europe (Figure 1). The arrival of photography also allowed people to think of new ways to use the power of photographs to immortalize their loved ones as best they could. Figure 1. Posing with the dead was a new tradition that emerged in the 19th century as photography became accessible. 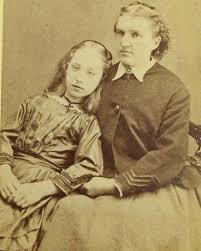 Here, a woman poses with her deceased daughter who is made to look alive. In the 1840s and much of the later 19th century, most people continued to die in their homes. This meant that soon after a loved one died it was often the local photographer who would be one of the first people summoned to the house. Initially, families did not do much to make the deceased appear better or nice in the photograph. Early post-mortem photographs even show people with blood on their mouths or if they died in a gruesome way there was no effort to hide this. However, even poorer families began to develop a new taste for clothing or scenery to help remember their loved one as post-mortem photography became more accepted and practiced. People began to consider ways in which they would like to remember their loved ones rather than use photography as a record of death itself. Different traditions did begin to emerge in Europe and the United States. In the US, families began to take photos and put them in boxes or mantels that would help remember the dead at home. In Europe, photographs were sometimes publically displayed to memorialize the deceased to others. It was not uncommon to find photographs of recently deceased in local papers or recorded in books. 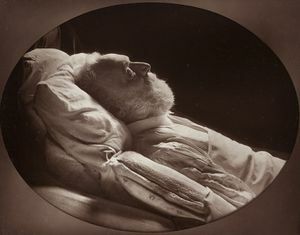 Famous individuals such as Victor Hugo were photographed shortly after death with these photographs publically displayed (Figure 2). By the second half of the 19th century, photographs of the recently deceased became more elaborate. Now it was routine to even open the eyes of the dead and make them as living as possible in photographs. This included in recreating family scenes or even scenes that displayed a form of active participation of the deceased in family activities. Families would even do family portraits with the diseased such as picnics or showing the family enjoying an outing. Symbols, such as drums or hourglasses, were often used as symbols of the dead in photographs, where these symbols would indicate that march of time and the limited time we might have. These would also help people realize that one of the individuals in the photograph was deceased, as often it was difficult to tell. This is particularly the case as cameras became better. In the early years, only the dead would look clear in photographs because they would not move, while the living were blurry, but later improved shutters made it hard to tell who was dead or alive. In the late 19th century and early 20th century, post-mortem photograph became less popular in the United States. However, there was some resurgence up until the 1930s. During this time, so-called "mourning tableaux" became popular, where the deceased would now be placed in a coffin and photographs of family members around the coffin would be conducted as a memorial photograph. By World War II, it was mostly ethnic urban minorities and rural populations that still practiced the tradition of post-mortem photography. Photographers such as James Van Der Zee in Harlem became well known for their post-mortem portrait photographs. James Van Der Zee, one of the Harlem renaissance figures, wrote a book called Harlem Book of the Dead that showed some of his work and symbolized the popular practice of post-mortem photography in some parts of the United States. Figure 2. Victor Hugo shown lying in state in his post-mortem photograph. In Europe, the culture of post-mortem slowly died during the 20th century. The key influence that changed this tradition was death occurred more frequently in hospitals rather than in the home. Death itself became regulated as well, as legislation in the United States and other Western countries increasingly made it less common or likely for people to die in their homes due to public health laws. This made it more difficult to photograph the dead as death became a part of medical practice rather than family experience for many, helping to erode the tradition of post-mortem photography as well. As many cultures in the 19th century had used post-mortem photography, many parts of the world did not experience the same shifts in practices that made post-mortem photography less common or even accepted in Western cultures. These cultures continued to practice this even up to today. In some eastern cultures, such Christians in the Middle East, prominent dead figures are still displayed publically and photographed, where they are made to look as if they are sleeping in their vestments. For instance, the death of bishops or well known religious figures is often displayed in this way. This is also done in Russia and cultures from Orthodox Christianity. In some sub-Saharan African countries, this is also practiced more commonly as a way to remember the dead, sometimes the photographs would be used as a public memorial. In the West, post-mortem photography has not completely gone away. The relatively few who do practice it mostly now take photographs of the dead in their casket and after they have been embalmed. The practice of dressing someone up in clothing that symbolized their life, such as their work uniform or wedding clothes, is still frequent in Western culture, where these individuals sometimes have their photographs that are mostly kept private in the family. African-American traditions have still kept post-mortem traditions to an extent. Elizabeth Heyert is one photographer who recently created a traveling exhibition of African-American post-mortem photographs showing the deceased in their finest clothing and looking like they are resting in their caskets. Perhaps it is a practice many of us find strange today, but post-mortem photography, whether publically displayed or shown mostly to family and loved ones, was very common in the 19th century. It was a time of rapid technological change that brought new traditions to families while also forcing people to reconcile with the fact that early or unexpected death occurred frequently. In photography, people found a new medium to grieve. The style of that grieving changed over time and in different cultures. Some chose to show the dead as if they are resting, while others tried to make it look like they were still living and actively participating in life scenes. These traditions have not entirely disappeared, as some cultures and sub-cultures within the West still practice this tradition. In the West, we are still fascinated by leaked photographs of dead celebrities or famous people. This, in a way, is similar or reminds us of our more common display of the diseased in photography in the past. ↑ For more on the development of post-mortem photography, see: Ruby, J. (1995). Secure the Shadow: Death and Photography in America. MIT Press. ↑ For more on how photography influenced new traditions, see: Linkman, A. (2011). Photography and death. London: Reaktion Books. ↑ For more on scenes of the dead in photography in the 19th century, see: Bryant, C. D., & Peck, D. L. (Eds.). (2009). Encyclopedia of death and the human experience. Los Angeles: SAGE, pg. 515. ↑ For more on photographers of the dead, see: Zarzycka, M. (2017). Gendered tropes in war photography: mothers, mourners, soldiers. New York: Routledge, pg. 78. ↑ For more on the cultural variations of death and post-mortem photography, see: Parkes, C. M., Laungani, P., & Young, B. (Eds.). (2015). Death and bereavement across cultures (Second edition). London : New York: Routledge, Taylor & Francis Group. ↑ For a recent exhibit on death and photography, see: Heyert, E. (2006). The Travelers (1. Aufl). Zürich: Scalo. This page was last edited on 27 December 2018, at 11:58.